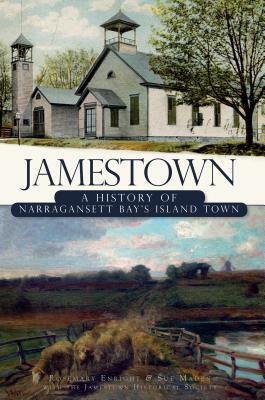 Jamestown, Rhode Island's history has been formed--both for good and ill--by its geography. The town officially encompasses three islands in Narragansett Bay--Conanicut, Dutch and Gould--plus a number of small islets known as "dumplings." Jamestown was part of the larger world when merchants and travelers used the common roadway of the bay. As the speed of transportation on land increased, that same bay isolated the town. Reliable ferry transport fostered the growth of a low-key resort, and the bridges that followed moved the community from resort to suburb. The changes have left Jamestowners torn. Some look back nostalgically at the ferries and the solitude they allowed, while others look forward to a vibrant village and grand suburban homes. Still, whether one is reviewing Jamestown's past or anticipating its future, the constraints of its geography remain forever unchanged.